The IGT AE Four is the modern successor of the renowned IGT AE inking unit. 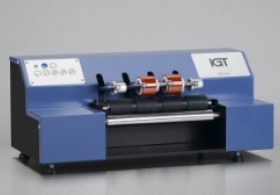 The IGT AE Four is used to apply ink films of reproducible and constant layer thickness on to the printing discs for IGT printability testers. It is possible to distribute up to four different inks at the same time. These discs can be used on the IGT printability testers AIC2-5 and all versions of the IGT Global Standard Testers as well as the A1-3 and A2-3 types (with use of an adapter). The IGT AE Four inking unit can be used to ink a maximum of 4 printing discs simultaneously. The AE Four does not allow for the temperature control of the roller system and has a simple operator interface using only pushbuttons. Inking speed 0,2 – 0,4 or 0,6 m/s. Top rollers available with 1, 2 or 4 sections. Printing discs lifted automatically after inking. Supplied with an IGT ink pipette. The IGT AE Four inking unit consists of a rubber top roller and two steel distribution rollers. The top roller can be used to ink a maximum of 4 printing discs. The inking speed can be set on 0.2, 0,4 or 0,6 m/s. The ink is applied in three stages; the top roller can be adjusted to three positions to ensure the ink is applied as effectively as possible. After the unit has distributed the ink evenly, the printing discs are brought into contact with the top roller and inked for the selected preset time. A special feature of this unit is that the printing discs automatically lift of the top roller as soon as the set inking time elapses. The printing discs can also be lifted manually.